If you want to become a contractor in Florida, you will need to obtain a Florida contractors license. 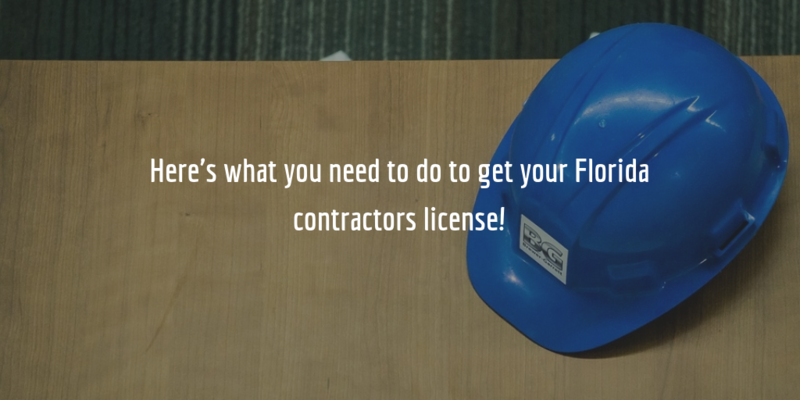 While a handful of occupations do not require obtaining a license from the Florida Construction Industry Licensing Board, most types of contractors in the state need to get licensed. Getting a license will require you to comply with the license requirements such as to obtain a Florida contractor license bond or pass a licensing examination. Read about the full licensing process below! The Florida Construction Industry Licensing Board offers two types of licensing to state contractors – registration and certification. The former allows you to work only in the area it is valid for (such as your county), while the latter allows you to work all over the state. See the ‘Definition of Occupation and Class Codes‘ for a detailed explanation of each type of license, and the type of work you can do if you obtain it. Depending on whether you want your license to be registered or certified, there are slightly different requirements for each. Once an applicant has covered the above requirements and has submitted their license application, the Licensing Board decides whether to approve the application. Typically, a license is issued two weeks after the Board meeting during which it was approved. If a license is denied, applicants receive a notice of intent to deny within 60 days after the Board meeting. Florida contractor licenses are renewed every two years. Registered contractors must renew their license on August 31 of every odd-numbered year while certified contractors must renew their license on August 31 of every even-numbered year. To renew their licenses, individuals need to pay a $209 renewal fee, and if they’re late with their renewal they need to pay a $309 fee. For those who have a license but are not actively working as contractors (a so-called current inactive license), they must pay $59 to renew their license, while for those who are not actively practicing and are late for renewing their license the fee is $218. To determine whether someone is financially responsible and stable, the Board requires applicants to submit a credit report from a nationally recognized credit reporting agency. If an applicant has a FICO score of less than 660, they must get a Florida contractor license bond. Applicants for a building, residential or general contractor license (Division I) must obtain a $20,000 bond, while all others (Division II) must obtain a $10,000 bond. By completing a financial responsibility course which is approved by the licensing board, applicants can reduce these bond amounts by half. Unless you comply with the financial and stability requirements, you will need to get a contractor license surety bond. The contractor license bond is an agreement the contractor makes with the state licensing board and the surety bond company. It guarantees that the contractor will comply with the conditions of the bond which are based on the rules and regulations for contractors set out in the Florida Statutes and the Florida Administrative Code. The bond also provides protection to the state and the public in cases when a contractor does not follow said statutes and causes damages and losses to either of these parties. They can then end up facing a bond claim which may offer compensation to claimants up to the full amount of the surety bond. The cost of your bond is a small percentage of the total amount of the bond you have been asked to obtain. How much exactly you will need to pay for your bond is determined by the surety bond company when you submit your application. To get a free quote on your Florida contractor license bond, simply complete our online surety bond application for, and we will shortly provide you with a rate on your bond. If you have any questions about the bonding process or want to know more about bonds, don’t hesitate to call us at 866.450.3412. Our surety professionals will be happy to help you out!